It’s not so the much the growth in the Catholic population revealed in yesterday’s census figures that raised eyebrows. After all, it was tiny, just over one per cent, bringing it to 45 per cent. No, it was the sharp drop in the Protestant population down from 53 per cent to 48 per cent. Falling below that 50 per cent figure was a staggering psychological shock for unionists many of whom still have it fixed in their head that they amount to two thirds of the north’s population. That’s the real headline, the fact that the gap between the two communities has narrowed to 3 per cent. Given the experience of the disgusting political dishonesty and irresponsibility of unionist leaders over the years, reinforced by their performances over the past fortnight, it’s too much to expect that they will propose any changes to deal with it. On the contrary, already within minutes of the census breakdown being revealed (and why does it take 18 months to crunch these figures for only 1.8 million?) unionists were clutching at percentages for people declaring themselves Irish (25 per cent) or northern Irish (21 per cent) and speculating about the religion (sic) of people who declared no religion. Wishful thinking. It doesn’t, and won’t mean they’ll vote unionist. Never have in the past and after the behaviour of the DUP and their Little Sir Echoes in the UUP about flags, they certainly won’t in the future. If he didn’t have wind of the exact figures it looks as if Peter Robinson had some inkling of the dramatic narrowing of the gap when he spoke to his party conference last month. As you read here at the time he was trying not to startle the horses by trying to convince supporters that even if the number of Catholics was rising it didn’t mean they wanted a united Ireland. What made the horses laugh was his suggestion they might vote unionist if unionists courted their vote. You can put any such notion to rest after Robinson’s stance about marches last summer and his evident desperation over the flag wars his party councillors initiated with their inflammatory leaflet. It has all gone horribly wrong for him. If he imagined his chosen candidate could win East Belfast the attacks on Naomi Long and her steady, coherent, rational response to them may have guaranteed her the seat for life. His own party members have scuppered the ploy he had worked on of trying to separate religion from identity. Yes, of course you’ll hear DUP people harping on about how many people declared themselves Irish as if that matters. 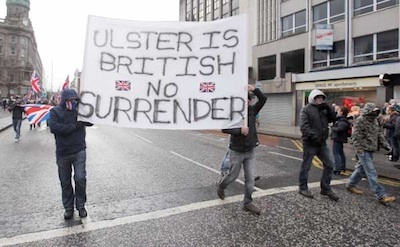 What you won’t hear until the next election is how many Catholics declared themselves unionist. The answer, if you want to know, is one per cent and how many of those were spoiled votes it’s impossible to say. What all the parties will be poring over now are the figures for electoral wards because the truth is they know perfectly well yesterday’s figures announce a huge sea change in the political landscape which has been coming for decades. The rise in Catholic numbers is not uniform across the north. It’s like a tide coming in, long thin fingers rippling in between rocks in some places, bigger volumes rushing in faster to cover other parts of the beach and eventually the water covers the whole beach except for little outcrops like Ballymena and Larne. What you’ve been watching in the past fortnight is Robinson acting the part of King Canute with Nesbitt playing the role of Baldric, all mouth and no trousers, trying to halt the tide of change coming in. You wait in vain for a wee bit of political honesty, of straightforwardness, a forthright admission that the terms of trade in politics here have changed. Instead Robinson lets his minions in the assembly try to inflame the situation by proposing changes to flag-waving at Stormont. And what do they want to do? Impose their will on another political community when the overall gap between the two communities is 3 per cent but west of the Bann it’s 80 to 20 in favour of nationalists in many places. The logic of Robinson’s inaction is to leave his fellow unionists there high and dry as his forebears did when they shafted their kith and kin in 1921.